Extreme Efficiency: How Low Can You Go? What do you get when you give an industrious engineer and solar energy enthusiast with an eye on the bottom line the chance to design his own abode? 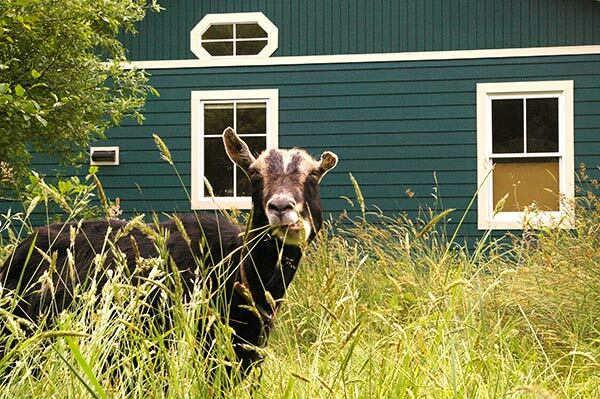 An extreme home—extremely energy efficient, that is. Larry Schlussler shows how far he can go in his quest for whole-house efficiency. 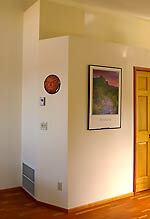 I moved into my new 960-square-foot (89 m2) bungalow in Arcata, California, on the fall equinox—September 21,. I wanted to run my house strictly on renewable energy, and demonstrate several energy conserving technologies I have been developing. I also wanted to build a home whose net carbon emissions would be zero. To achieve this, I incorporated passive solar design strategies, a solar thermal system for water and space heating and cooling, a grid-tied solar-electric (photovoltaic; PV) array, and some special energy and water efficient features. On a yearly basis, my house is a net producer of energy—without burning any type of fuel, nonrenewable or renewable. This unique climate has a number of implications for solar home design. Good ventilation can control overheating caused by too many east- and west-facing windows, and deep overhangs on south-facing windows, which usually prevent summer solar gain into the house, are not needed. My house incorporates 70 square feet (6.5 m2) of south-facing windows, and a sunspace entryway that has an additional 70 square feet of glazing. The sunspace has single-pane windows, which only cut out about 10 percent of the incident solar radiation. The fraction of incident solar radiation that passes through a window is called the solar heat gain coefficient (SHGC). With an SHGC of 0.9, these windows maximize heat gain into that space. During the night, I close the door between the sunspace and living space, so heat loss through the single-pane windows is not a primary concern. Interior windows on the south side of the house incorporate clear, double glazing with an SHGC of 0.8. The standard low-E (low-emissivity) glazing offered by my window manufacturer has an SHGC of only 0.41—not something you'd want if you're trying to depend on solar gain for passive heating. Designing for optimal heat gain and minimizing heat loss through the windows is an important consideration in passive solar design. Heat loss through a home's windows can be nearly as large as the total heat loss through all its walls. The windows on the north side of my house, where solar gain was not a consideration, have low-E coatings to minimize heat loss. Low-E, double-glazed windows lose about 35 percent less heat than clear, double- glazed glass. Argon gas-filled windows reduce heat loss by about 50 percent. (The total loss in a window is always greater because of heat loss through the frame.) 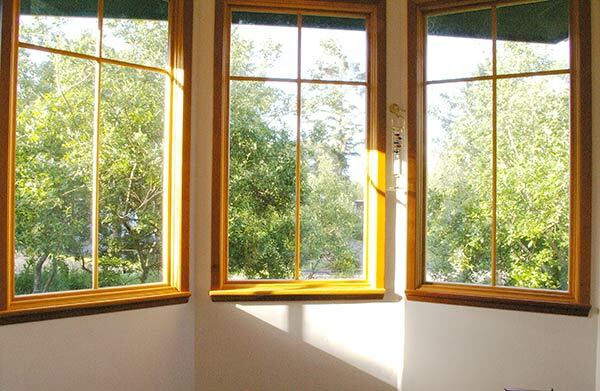 Windows come with a variety of coatings to control solar heat gain, visible light transmission, and R-value. Consideration should be given to the array of coatings possible before specifying a glazing. South-facing windows were set into the wall as high as possible so that the light and heat penetrate into the space as far as possible. Several small clerestory windows on the east and west walls provide additional natural light without admitting too much heat. A tubular skylight brings light into the windowless bathroom, eliminating the need for using artificial light during the day. To reduce nighttime heat loss, I installed "double honeycomb" cellular shades, which incorporate a small air space between two layers of fabric. When closed, these shades roughly double the R-value of the double-glazed windows. The 6-inch-thick (15 cm) walls of the house are insulated with R-19 fiberglass insulation and the ceiling is insulated to R-30. I opted not to put any additional thermal mass into the house. In Arcata, we often get prolonged periods of rainy weather during the winter months. Considering the climate and my lifestyle, additional thermal mass would be a detriment. When the house is unoccupied during the day, heat is not necessary. On rainy days, I want the house to warm up quickly in the morning and when I arrive home at night. With additional thermal mass, the house would not heat up as rapidly, but would stay warmer further into the night when I am sleeping. It would also stay warmer later into the morning when the house is no longer occupied. Keeping the house warm when it is not necessary would increase heat loss and energy consumption, even if the heat was provided by thermal mass. Without any additional thermal mass, on sunny days during the winter the house stays at a comfortable temperature until I go to sleep. Indoor temperatures are typically in the low 60s by the next morning, when the temperature outside is in the low 40s. 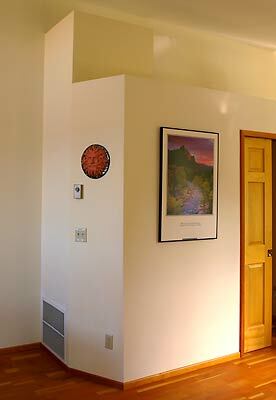 The house also incorporates 80 square feet (7 m2) of solar thermal panels, which heat up 160 gallons (605 l) of water. This water is used for domestic hot water, cooking, and space heat. The 160 gallons of hot water can be thought of as thermal mass that is isolated but can be called upon to heat the living space when desired. If I need heat in the morning and it was sunny the previous day, the heat stored in the hot water tank will heat the house. But when the rains began in November, my solar thermal system was not always producing an adequate amount of heat. I then added a 5,500-watt instantaneous electric heater to boost the water temperature. 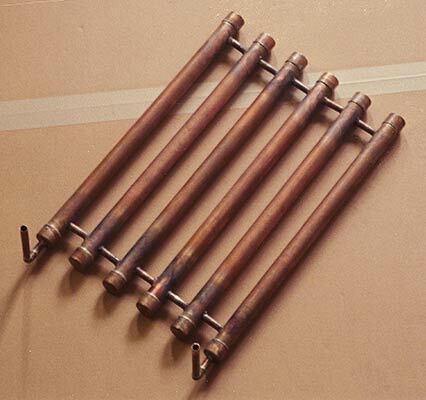 For space heating, the hot water is distributed by fan coil heaters. These devices look like car radiators. 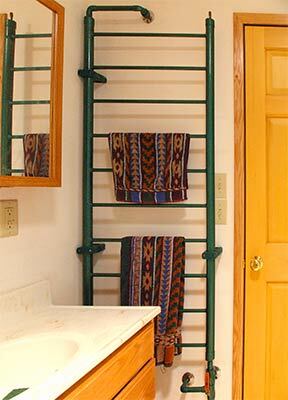 To heat the bathroom, I constructed a combination radiator–towel warmer. 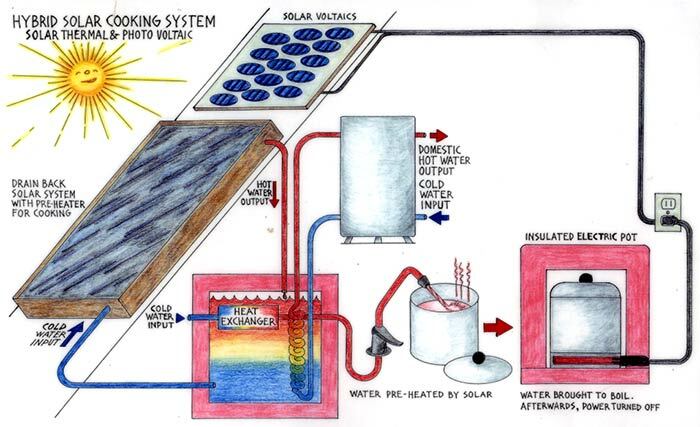 The fan coils were oversized so that comfortable conditions could be attained with relatively low- temperature hot water—an advantage with solar hot water because the solar collectors become less efficient as the water gets hotter. Radiant heating is an excellent way to provide comfortable, uniform temperatures, but convective heat also has its place. In convective heating, air is heated more than surrounding surfaces. The fan coils I use are convective heaters. 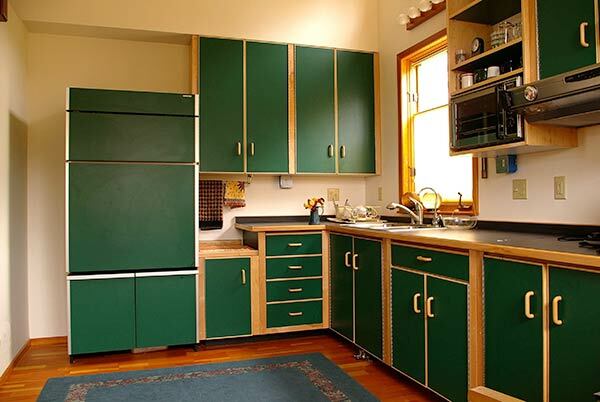 The advantage is that they can rapidly warm up a space without keeping the space warm long after heating is needed. It would take about 20 times more energy to heat the thermal mass in my house than to heat the air. Typically, the air will get about 7°F (4°C) warmer than the surrounding thermal mass; thermal comfort is dependent on both the air temperature and the mean radiant temperature (the temperature of surrounding surfaces). I also set my sights on reducing my hot water consumption. A major component is my energy efficient shower. This totally enclosed shower allows me to take a comfortable shower with a water flow rate of only 0.5 gallons per minute (0.03 lps), when 2 gpm (0.13 lps) is usually considered low flow. 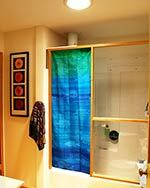 The shower stall has a clear Plexiglas ceiling located about 1 foot (30 cm) below the bathroom ceiling. 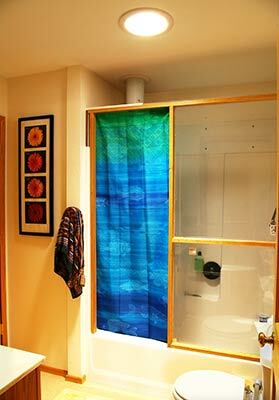 A 2-foot- wide (61 cm) shower curtain serves as the shower door. Clips seal the curtain at its bottom and sides. The rest of the wall is clear Plexiglas. This configuration allows for a comfortable shower even if the air temperature in the bathroom dips to 50oF (10°C). It also helps eliminate moisture problems, the need for ventilation systems, and mold growth. 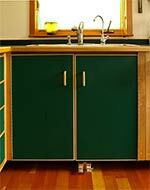 The house is fitted with a conventional flush toilet to meet building codes; however, I almost always use a composting toilet, located in the utility room. 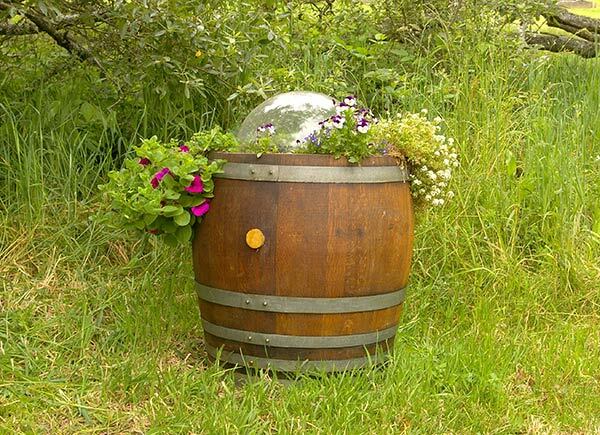 Composting toilets conserve water and turn a waste product into a valuable soil amendment. 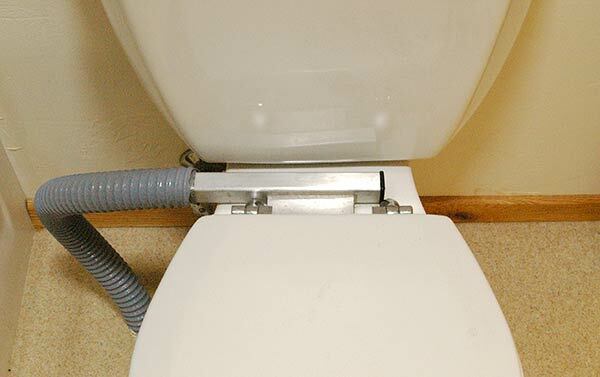 A well-designed composting toilet has very low odor and keeps pathogens at bay. This technology has a large potential for conserving water and resources, but has been generally overlooked. In areas that have been devastated by natural or human-made disasters, such as Louisiana or Iraq, composting toilets would be an ideal solution for sewage treatment. I've also managed to improve the efficiency in my kitchen by using what I term a "solar hybrid cooking system" and by recycling my food scraps. The cooking system incorporates water that is preheated by my solar thermal system, and insulated pots that are electrically heated and thermostatically controlled. Instead of using a garbage disposal, which uses water and energy, and increases the waste that needs to be disposed of at the local sewage treatment plant, I compost my food scraps. I chose to use a drain back solar hot water system because the system uses no antifreeze, and it incorporates an unpressurized storage tank. Choosing an unpressurized storage tank allowed me to build my own tank and heat exchanger. My hot water system consists of a 160-gallon (605 l) unpressurized tank and a 40-gallon (141 l) natural gas water heater; however, the gas was never turned on. The 40-gallon tank is located above the unpressurized tank. 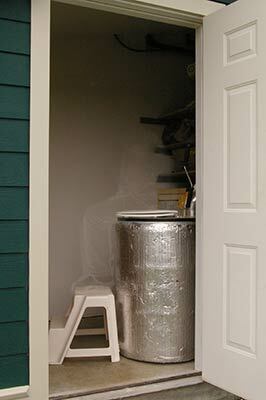 Heat is transferred from the unpressurized tank to the 40- gallon tank by a passive thermosiphon loop. Heavier cold water leaves the bottom of the 40-gallon tank, and then goes to a heat exchanger in the unpressurized tank, where it is warmed. It then rises to an entrance at the top of the 40-gallon tank. 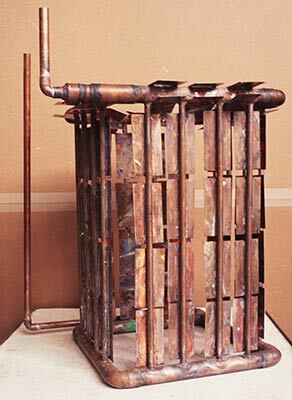 Instead of using a long coil of copper tubing as a heat exchanger, I constructed one that uses several parallel paths to minimize flow resistance. I put a pump in this loop in case the thermosiphon loop was too slow, but I found that it is seldom necessary to turn it on. If the gas was turned on to heat the 40-gallon tank, this particular system has two potential problems. After a long cloudy period, if I used a lot of hot water the morning of the first sunny day, the water would be heated before the sun could do its job, and the energy used to heat the water in the 40-gallon tank would essentially be wasted. Another problematic situation would occur if the thermostat in the gas-heated tank was set to a higher temperature (say, 110°F; 43°C) than the water in the unpressurized solar tank (say, 100°F; 38°C). With colder water in the lower tank, the thermosiphon loop would make no contribution—even if the incoming water was at 50°F (10°C). I anticipated alleviating this problem by incorporating several valves in the system, which would allow incoming cold water to first go through the heat exchanger in the unpressurized tank. After leaving the heat exchanger, this warmed water would then enter the cold- water inlet at the bottom of the 40-gallon tank. I later realized that these management problems could be eliminated by incorporating an in-line (on-demand) water heater at the output of my 40-gallon tank and by not connecting the gas heater. Then, the question was: Should I go with a natural gas or electric in-line heater? At the generating plant, three units of energy from natural gas are typically needed to produce a single unit of electrical energy—the 33 percent efficiency is a consequence of inefficiencies and the second law of thermodynamics, which states that all the heat energy in the gas cannot be turned into electrical energy. 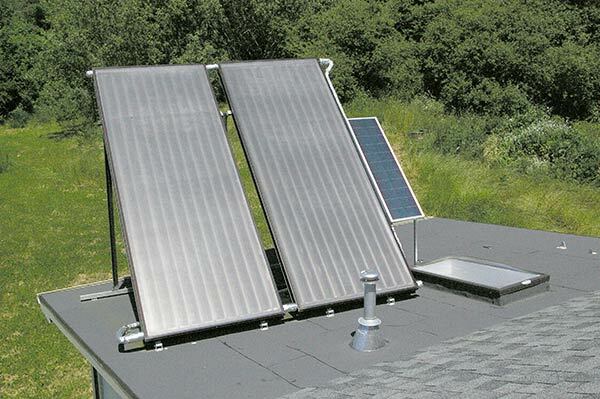 My solar thermal system often warms the water to 100°F (38°C) during the winter. With the low flow rate of my energy efficient shower, I would only need 3,100 Btu per hour to boost the temperature of my hot water to 115°F (46°C). The lowest output I found on an in-line gas water heater was 16,000 Btu per hour, which would mean wasting 80 percent of the heat. Since an electric heater can modulate its output so that a boost of only 5°F (3°C) or less can be made, I decided to use an electric water heater. 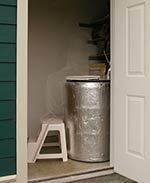 In the future I may split the output of my 40-gallon tank and use an instantaneous electric water heater for my domestic hot water, and an instantaneous gas heater to boost water temperature to my heating system. 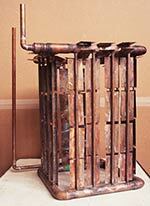 The larger output of the gas heater can be effectively used for space heat. This strategy would result in less carbon dioxide being generated; however, it would increase my utility bill because I'd be paying for gas. 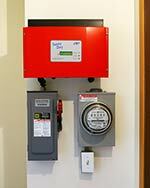 My 1,670-watt solar-electric system consists of ten Sharp 167-watt PV modules and a Sunny Boy 1,800-watt inverter. During the darker part of the year, from September 21 to April 13, 2005, my net production equaled my consumption, and my PV system and solar thermal system supplied all my energy—no additional backups were required. During the summer months I contributed quite a few KWH to Pacific Gas and Electric (PG&E), my local utility company. PG&E charges US$4.97 per month to be connected to the grid, and then sends a yearly bill based on net annual electrical use. If you generate more energy than you consume, you do not receive a refund for the extra KWH you produce. I would like to see an incentive program that would pay a bonus if your net annual electricity consumption was zero or less. 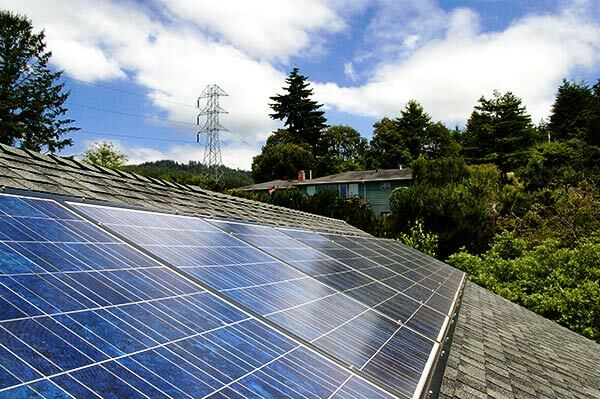 A program based on net performance would encourage conservation and also encourage the homeowner to make sure their PV system continues working at peak efficiency. The losses in the PV panels are primarily due to solar heating. For each degree Fahrenheit the panel temperature rises above 77°F (25°C), the output decreases 0.27 percent. A pole-mounted array will typically be about 40°F (22°C) above the ambient temperature. 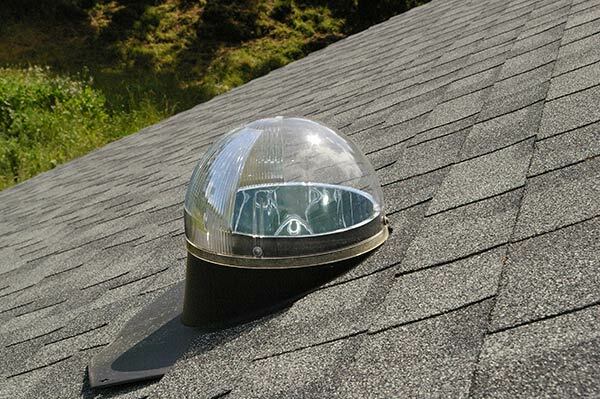 A roof-mounted array with a small clearance between the roof and the array could heat up to 65°F (36°C) or more above the ambient temperature. In inland California where temperatures climb to the 90s, this loss alone could be more than 22 percent. For aesthetics, I used a mount that placed the panels fairly close to the roof's surface (3 in. ; 8 cm). The mount has a skirt in front of the panels that is only 1 3/4 inches (4.4 cm) from the roof surface. Using an infrared thermometer, I estimated that the cells were about 62°F (34°C) above the ambient temperature. With a mean daytime ambient temperature of 60°F (16°C), the average loss is then 12 percent. Because panel heating can influence the system's production, both PV panel and mount manufacturers should include information on how mounting configurations affect efficiency. My calculations showed an overall efficiency of 81 percent. At this efficiency, and 4.4 peak sunlight hours per day, the output of my system should be 5.95 KWH per day, or 2,172 KWH per year. My measured output over twelve months was actually 2,130 KWH or 5.8 KWH per day. This was in excellent agreement with the calculated value; I was actually surprised these figures were so similar. On a yearly basis, my solar-electric system produces 3.5 KWH per day for each KW of solar array. This figure is useful to see how large an array is needed to run an appliance. For example, my Sun Frost refrigerator consumes 0.27 KWH per day. Seventy-seven watts or a little less than half of one of my 167-watt modules can run the refrigerator. The installed cost of a grid-tied system can range from US$6,500 to $11,000 per KW, depending on the ease of the installation, and the cost of the equipment and labor, as well as the size of the system (i.e., larger systems cost less per watt). Assuming the cost per KW is US$8,500 in Arcata with an average production of 3.5 KWH per KW of solar array, an investment of US$2,444 is required to produce one KWH per day. In a stand-alone system, the investment required to produce 1 KWH per day is roughly double that, or US$5,000. The extra costs are due to a voltage mismatch between the PV panels and the batteries, the efficiency and limited storage capacity of the batteries, and the need for a backup system. During the summer, batteries are sometimes filled up by noon, and the output of the PV system for the remainder of the day is typically wasted. 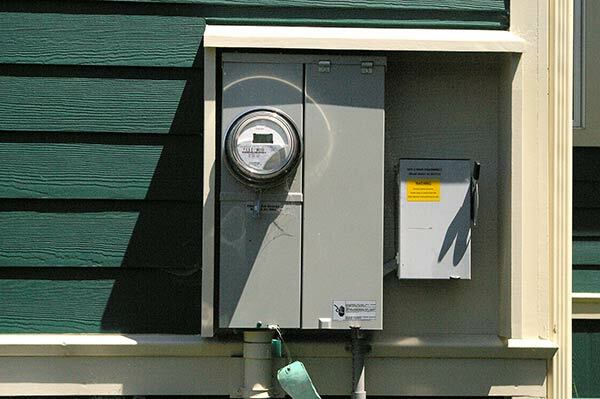 Charge controllers are currently available that minimize the voltage mismatch between the panels and batteries and increase the output of a PV system. Conservation is a good investment if you can reduce your energy consumption 1 KWH for less than the cost of generating 1 KWH. For example, in a grid-tied system, if you purchase a product that consumes a KWH less than a competing product and its additional cost is less than US$2,444, it would be a good investment. The product should have the same life expectancy as the PV system. In an off-the-grid system, an investment up to US$5,000 would be worthwhile to save a KWH per day. 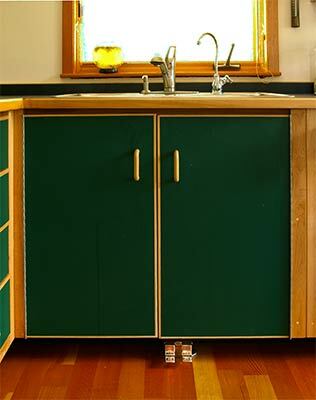 More progress can be made in making a home's basic functions more efficient. 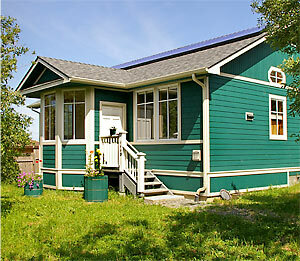 Incorporating daylighting, implementing passive solar design strategies, installing a solar domestic hot water system, improving the energy efficiency of the cooking process, improving washers and dryers, recycling organic wastes like food scraps and human manure with composting systems, and using gray water systems to irrigate gardens are just a few changes that can substantially improve a home's energy efficiency. These potential improvements are a resource that is just barely tapped. Improvements in these areas will save energy more expeditiously and at a lower cost than will supply-side solutions.